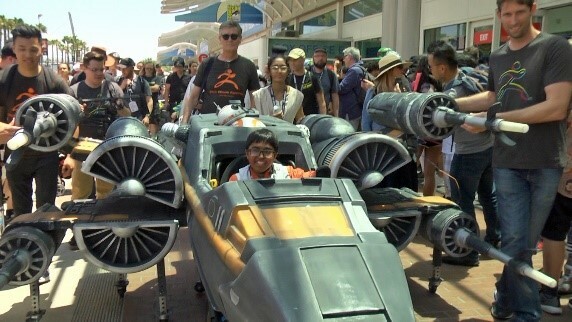 Massivit 3D and customers create the ‘world’s first’ 3D printed Poe Dameron X-Wing Fighter charity wheelchair costume at Comic-Con International in July 2018. The wheelchair costume was the vision of non-profit organisation, Magic Wheelchair who created the costume for Star Wars fanatic and 13-year-old Vedant Singhania. Companies who worked with Magic Wheelchair included Pixologic Inc who were responsible for the design and modelling, Dangling Carrot Creative who 3D printed the costume with Massivit 3D donating the printing materials and Monster City Studios who completed the assembly and finish. Dangling Carrot used the high print speeds and dual print heads of the Massivit 1800 3D printer and produced 50 separate costume pieces in over 2 weeks. The 2.44m high and 3m long spaceship provided Vedant with his very own Star Wars X-Wing fighter which was crafted by some of the original Lucasfilm prop fabricators. Magic Wheelchair creates bespoke costumes for children with wheelchairs free of charge to their families. As part of Comic-Con’s ‘Star Wars Experience’, its partner Pixologic who are the supplier of ZBrush digital sculpting software, Magic Wheelchair chose Vedant to receive the impressive 3D printed costume.